Transit Police report arresting a Somerville man they say tried to rob somebody of sneakers at the Quincy Center Red Line stop yesterday afternoon only to fail in the attempt because the commotion drew the attention of other passengers and he decided to run away instead. Read more. The MBTA reports delays of up to 15 minutes on the Red Line into town from Quincy due to a train that had to be taken out of service due to some sort of door issue. The MBTA reports delays of up to 15 minutes on the Braintree branch of the Red Line, due to a track fire at Quincy Center. The MBTA promises to investigate. The MBTA reports "moderate" delays on the Red Line because of a train currently pushing up daisies at Quincy Center. Transit Police are seeking the public's help to find this guy for an incident on a bus on Hancock Street near Quincy Center station around 2;30 p.m. on April 21. Read more. The Quincy Sun reports on an incident this afternoon in Quincy Center that ended with two under arrest. The T briefly stopped Red Line service through Quincy Center so officers could search for one of the suspects. The Quincy Patriot Ledger reports police arrested a man they caught masturbating in a Quincy Center parking lot outside two different restaurants on two consecutive days - and that when they put him in lockup, he started right up again. He faces a variety of charges. In practice, looks like the Red Line (and the Orange Line) might need some more work. 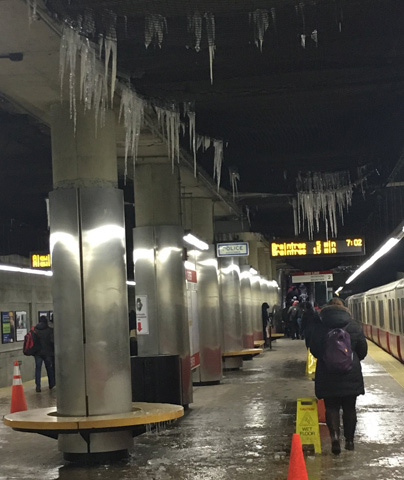 Agiraffes shows us what Quincy Center looked like at 9:15 a.m. due to "minor" delays. At the other end of the Red Line. Yet another Red Line train has departed this mortal coil, this time at Quincy Center. You know the drill. "Moderate" delays between Quincy Center and Braintree, the T advises. Its passing comes about 30 minutes after the T reported "minor" delays inbound on the Ashmont branch due to signal problems. There's a dead train somewhere on the Orange Line (the T isn't saying where) and a train that breathes no more at Quincy Center on the Red Line. Passengers are not happy, but whadaya gonna do? The T is advising "moderate" delays into town on the Red Line from Braintree due to a train that just could not make it past Quincy Center, and "minor" delays into town on the Orange Line from Forest Hills, due to a train that ascended to the pearly gates at Mass. Ave. Seems our second president would have preferred July 2 as Independence Day, although that would have deprived us of that story about him and Jefferson both dying within hours of each other on the national holiday. 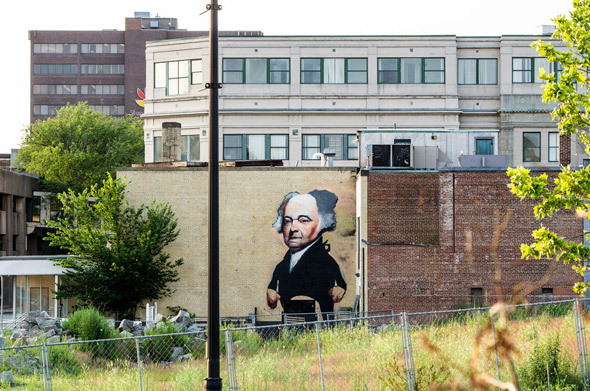 David Parsons captured the Adams mural in Quincy. Copyright David Parsons. Posted in the Universal Hub pool on Flickr. Between Quincy Center and Quincy Adams, Peter Wilson reports. The Quincy Fire Department is on scene to help with evacuation. WCVB reports the train was stuck for two hours. Scott H took photos at the scene. Passengers getting on escape bus. Meet Tina Lunn, who, at least based on the account provided by Transit Police of her arrest at Quincy Center yesterday, is a few cigarettes short of a full pack. Transit Police report they are looking for this guy for an incident involving indecent assault and battery on an inbound Red Line train around 7:10 a.m. on July 29, not long after he'd gotten on the train at Quincy Center. He's described as Hispanic, 20 to 25, 5'5" to 5'7" and thin. Transit Police report a man was found stabbed at the Quincy Center T stop around 3:20 a.m.
Erik Manley, 37, of Braintree, was arrested on a charge of assault and battery with a dangerous weapon. The victim, 35, from Weymouth, was taken to a local hospital and is expected to survive, police say. Red Line at Broadway around 9 a.m. Inbound, of course. Not one, but two Red Line trains groaned and left this plane of existence this morning. Had to unload train, nearly 30 minutes waiting so far. Scrambling T workers. Doors were closing on passengers as they were exiting over and over. Earlier, around 7:20 a.m., another inbound (natch) train pushed up some daisies at Quincy Center around 7:20 a.m., leading to scenes like this.